Hiking is the great equalizer, and all it requires is some willingness and a good pair of shoes. Squamish is home to some of the best hiking in Southern British Columbia, from long multi-day backpacking routes to easy summits to mellow, meandering walks in the woods. And who doesn't love a walk in the woods? If you've got the whole family in tow, including some of the little ones, there are a bunch of great easy hikes around Squamish to get your hiking on. The Oceanfront Trail runs along the shores of Howe Sound and starts just across from the Howe Sound Brewing Company. It's a short hike, approximately 2km, but one of the most spectacular in Squamish. About halfway along the trail, it reaches the water, and here Newport Beach stretches all along the coastline. When the tide is out on a hot sunny day, there is no better place to be in all of Squamish. It's a great place to spend the day with a good book, mucking about on the many massive chunks of driftwood lining the beach. One of the best family-friendly hikes in Squamish, the Four Lakes Trail is located just north of town on Highway 99 in Alice Lake Provincial Park. This trail is a 2 to 3-hour loop that meanders through the beautiful coastal forest to four distinct mountain lakes. All four lakes; Stump, Edith, Fawn and Alice offer views of the surrounding peaks that are breathtaking. As an added bonus, Alice Lake has one of the best family campgrounds in the Sea to Sky Corridor. Shannon Falls is the third highest waterfall in BC. It's a spectacular sight to see, especially late in the day when the sun is shining directly on the falls. Shannon Falls Provincial Park is adjacent to the Stawamus Chief just south of Squamish on Highway 99. It's a small park, and the hiking trail here is easy and accessible to people of all ages and abilities. It's a short walk up to the base of the falls, along Shannon Creek, through some of the oldest forest in Squamish. The trees here are massive, and when the waterfall is pumping, cascading some 335 metres down the cliffs, there is a light mist that bathes everything in a golden light. At the start of the trail just off the parking lot, is a great picnic spot with tables and some of the best views in Squamish. Murrin Park is a small Provincial Park just off Highway 99 about a five-minute drive south of downtown Squamish. This park contains some of the best rock climbing in Squamish, and also a great hike and lake. Right at the entrance to the park is Browning Lake, there is a beautiful trail that meanders around it with picnic tables all along the west side. If your kids are a bit older and feeling adventurous, the Murrin Park Loop Trail offers a few lookouts over Howe Sound that are breathtaking. 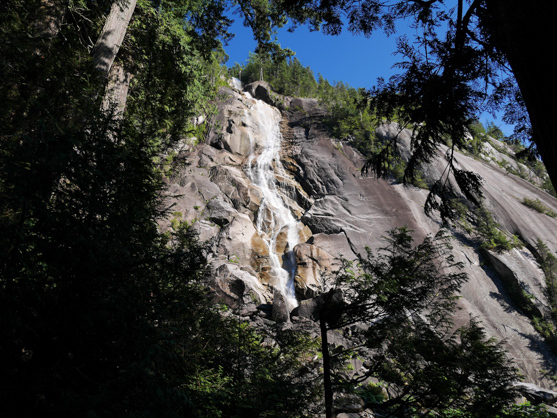 A short disclaimer, the Stawamus Chief is not an easy hike, but if you and your kids are active and willing to try something a little longer, it is one of the most popular hikes in British Columbia. Located next to the highway the Stawamus Chief is hard to miss. It's a 700-metre tall granite monolith overlooking the entire Squamish Valley. For climbers, the Stawamus Chief is Canada's version of El Capitan in Yosemite. But for hikers, it's as grand a prize. The hiking trail wanders up the back of the Stawamus Chief to each of the three peaks on the summit. Taking anywhere from 3 to 6 hours, the Stawamus Chief is a long hike, but if you pack a lunch, some determination and lots of water, the views on top will be remembered for a lifetime. Dog-Friendly: Yes, difficult for all dogs and not recommended for larger breeds. All dogs must be leashed. A kid-approved scavenger hunt hiking experience located atop the Sea to Sky Gondola. Free family tours are available at 1 pm Saturdays and Sundays, or pick up a scavenger hunt card from the trailhead and set out on your own. Along the trail, you will need to help find lost hiking gear hidden around the trail, once complete return your card to guest services for a special prize. This trail is a short out and back to the Garibaldi Viewpoint, from here you can turn around or connect with the Panorama Trail to make a loop back to the Gondola. Please note Alpine Alley is intended for people only, leave your pets at home.